The Kipper team likes to get into wild discussions about all the same feelings and questions everyone has when wearing sneakers with a suit: “When is the right and wrong time to wear them? Do they actually look good with a suit? What’s this 'sneaker game' talk everyone is chatting about?” These are all legitimate questions to ask, especially for those sneaker heads, active lifestyle enthusiasts, and comfort seekers. Here’s a central theme, however, that you should keep in mind when trying to pair up your favorite shoes with your suit: your suit is in charge, not your shoes! Keep your sneaks modest, or make sure they’re complimenting your suit in a way a pair of oxfords can’t. In this way, it may be easier to even think of your sneaks as an accessory to your suit, and just like your favorite watch or bracelet, if it’s not flattering to wear you’re probably not going to wear them, right? So, is it generally okay to wear sneakers with your suit? 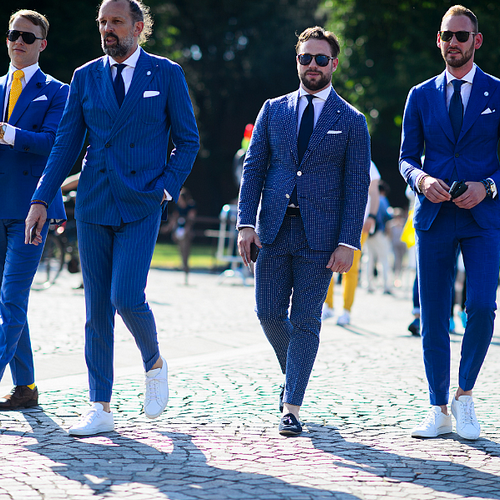 Yeah, definitely, but there are some general guidelines to follow because some sneakers, like Common Projects, Adidas Originals, and even Vans are great to wear with suits anytime, granted that you know you’re going for something casual (with an urban flair!). Other shoes that are very narrow, like Converse (Jack Purcell’s are acceptable!) but really thick basketball shoes, are often a “no-go” and should be avoided due to how the shape of the sneakers distorts the silhouette of a person’s overall shape in a suit. All in all, it’s important to remember that when pairing up sneakers with a suit there is a certain degree of casualness that will accompany your overall look, but in no way should they outshine the overall sharpness, shape, and color scheme of your suit. There are a lot of sneakers out there worth trying to pair up with a suit, but Kipper suggests this to keep in mind: there are certain sneakers that work and some that are too casual; if there’s a pair of kicks that you just have to wear with your suit, and you’re not sure if they’ll work, just remember the three “S’s:” Sharpness, Shape, and color Scheme (close enough). Now go out there and strut your sneakers in confidence! Looking for more style advice? Check out some of our archived posts here.